It is the little everyday things that keep one going in this life. I was feeling somewhat saddened by the end of the availability of a very good little daily newspaper, very cheap from the mainland when I read in same newspaper of a special exhibition taking place in London “Jumping for Joyce“. 20 contemporary artists were commissioned by the Francis Kyle gallery in London to do responses and interpretations on James Joyce and his work. The review (John Walsh-Independent) and photos were very enticing and I thought that rather than despair at not going to London, see if they had a catalogue. They did and it arrived two days later. Feeling very pleased about this as it exceeded my expectations I decided to venture forth next day to St. George’s Market in Belfast. It’s enclosed so weather is irrelevant. Wandering about not knowing what to taste or look at next I came to a bookstall (Belfast is amazing for second hand books) and idly looking through a reduced price box I light upon one of my beloved Russian books that I no longer have. It is £1! So with the £10 for the painting catalogue on Joyce and my book of photos of pre-revolutionary Russia for a total of £11 I have rediscovered Utopia. The Joyce paintings have a very European feel to them. For me, they illustrate Joyce‘s works intensely and intuitively. For someone whose writings we are led to believe are exceedingly complex this group of artists have been quite comfortable in their interpretations. Needless to say, the paintings would benefit from closer look. When you can look at a work of art and think this is really capturing the artist’s thoughts and it is an aesthetically realized composition it is quite enough. 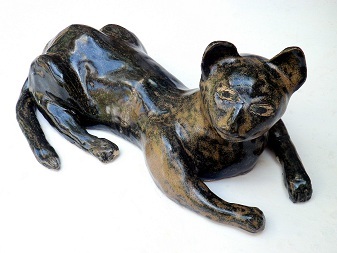 Although not totally enamoured with them all they appear to be successfully worked and one particular piece, a ceramic cat “Leopold Bloom’s Black Cat” by Psiche Hughes I would love to own. Another work which is also the cover of the catalogue “The Wanderer 11” by Anna Wimbledon is one of those pieces that catches in my throat. Joyce was such an appealing man. Who cares what faults he had. The feminists engage in their endless debates on Nora Barnacle but she was his muse. Full Stop. I was not entirely convinced by some of the interpretations of Molly Bloom (Nora) amongst the works but she herself was complex and I would suspect too enigmatic to be fully understood. Still the challenge is always there. She lives. My Russian photo collection includes some old photos of the Crimea which has a connection to my Mother’s paternal family of which I have never been able to discover the source. I had hoped one day to visit Crimea and maybe learn something intuitively or psychically . Hopefully it may still happen. Travelling to other countries in the past and in the present has always been considered a valued component for culture and yet in Joyce’s Ulysses a lifetime of “travel” is experienced in one day. Joyce insisted that he was not serious about the work and yet the monumental detail hints strongly that perhaps “internal” is the ultimate journey. He would like us to think that he is playing with surface but he delves too thoroughly into the subconscious and like many great writers was not afraid to wade into the murky waters of every mans’ soul. It is curious that Joyce who after leaving Dublin spent his life travelling and yet his major works are journeys within the subconscious.Finnegan’s Wake itself offers many challenges. There is still much to discover. The exhibition goes on to the end of September.